Fred Dorward grew up in Viking Alberta, his wife Chris near Alcomdale, west of Morinville. Because of their professions of engineering and nursing, they were urbanites, however their heart was in the country. This they instilled in their children. Fred’s hobbies included finding rocks and making jewelry, berry and mushroom picking, bird hunting and fishing. All could be plied within an hour’s drive of Edmonton. Travels went in all directions, east toward Viking, west toward the Rockies, south to Drumheller and north to Thunder and Fawcett lakes. A connector of all these pursuits were maps. Fred loved maps. He had virtually all the topographical maps that were available at the time surrounding Edmonton. Marked on those maps were favorite gravel pits, creeks with petrified wood, creeks and lakes, berry patches, duck hunting spots and favored boat launch locations. As young as 6 I was out with dad constantly from May to October. By age 12 my brother Ross and I were pretty proficient in planning a trip and packing the right maps (and the station wagon) for the day or weekend. We understood how the topo lines on the maps worked and whether a hill was going to be too steep to climb before we got there. We understood where to turn off the highway and how to plan to get around a lake or over a bridge. We hiked before hiking was cool. We did it with Converse running shoes and minimal equipment, at times down dusty roads. At first opportunity we got off the road and into nature that we loved. I was born in Toronto, Ontario my older sister in Peterborough. Mom and Dad were westerners, but GE Canada’s lighting division had moved young engineer Dad and Mom to Ontario for 4 years of training after university. There dad met folks who became involved in 1960 with a new trail in Ontario called the Bruce Trail. We were back in Edmonton when it all came together. Dad’s understanding of rural Alberta, his love of maps, his knowledge of nature, his acumen to structure an organization and seek support, his dislike of walking down gravel roads, and inspiration from the early days of the Bruce Trail gelled together when, in the fall of 1966, the federal government had a series of ads on TV encouraging Canadians to create something or do something to commemorate Canada’s 100th birthday in 1967. The trail was an idea! Where would it go? I recall vividly the topo maps in our living room in Avonmore that first winter. (I recall my mom asking when the maps would finally be cleaned up.) We discussed going to the west. The land was higher, less marsh, fewer lakes—but there was not a natural flow to the land in terms of a circle routing. 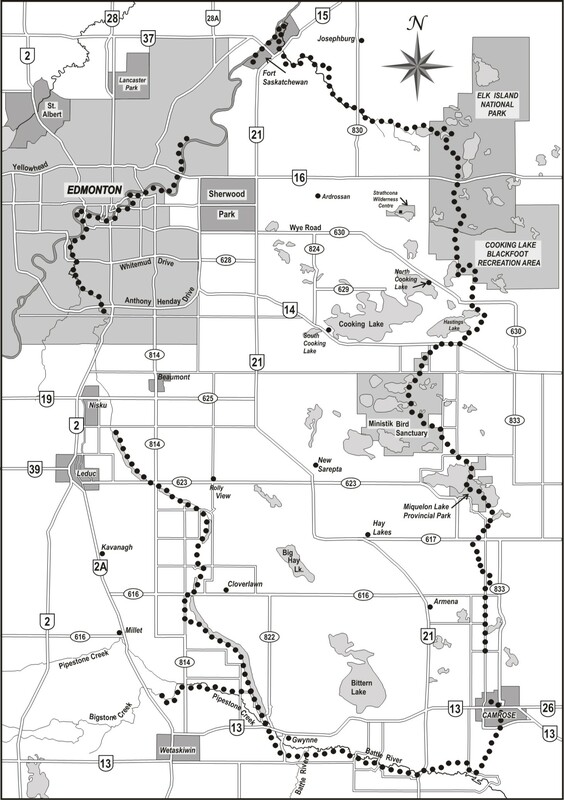 Conversely, the land to the east had more natural paths, Whitemud/Blackmud Creeks, Coal and Saunders Lakes, Battle River, with Camrose as a stopover, Miquelon Provincial Park, the provincial area now known as Blackfoot, Elk Island Park, Ross Creek, Ft. Saskatchewan, Gibbons, Sturgeon to St. Albert and home. It seemed all so natural. Fred was smart enough to know that help was required to do the massive amount of work to set up memorandums of agreement, contact land owners, deal with government, build a club following and get going. He approached a club that he was in, the Oil Capital Kiwanis Club to help. They agreed very quickly to support the project. The discussion of Ross and I hiking the trail was brought up by Dad in the winter of ‘67/’68. I had just turned 16, Ross was 14. We had no doubt that we could do it, and we pretty much just started planning and getting on with it. For us it was just an extension of what we had been doing for years. Just for a longer time. Dad dropped us off in Whitemud Park at 5:00 a.m. on Thursday, July 18, 1968. We hiked 290 km over the next 14 days. Dad came and met us three times over that time, otherwise we were on our own. The hike was grueling. We were always short of good water, although homes and farms along the path were most generous. We drank from a well that we found later had been contaminated, we were chased by a bull that had very large horns, and we endured some serious bog and slough conditions at times. But we had for the most part good weather and we absolutely loved the trip. The Mayor of Camrose met us and we had a whole lot of folks from St. Albert greet us. We were allowed to camp overnight in Lions Park in St. Albert although that night sparks from the fire burned our sleeping bags (no burns to us). We were honored to have Lt. Governor Grant MacEwan meet us in Emily Murphy Park when we returned. When we got home we really enjoyed seeing an unlimited amount of water come out of the taps! As a result of that hike, Ross and I were able to speak to many service clubs and scout groups over the next couple of years. We were more scared of doing that than hiking the trail! But that brought in interested individuals and volunteers and helped to expand the number who were learning about the trail. Fred continued to meet with landowners and develop the team that would continue the work of the Waskahegan Hiking Trail Association until he retired to Whitehorse in 1980. There Fred continued his outdoor pursuits with tourist tours, prospecting for precious stones, working on local trails, saskatoon picking, and northern gardening as well as sponsoring the filming and recording of historic sites in the Yukon. The Waskahegan torch was passed to Stan Skirrow and many others who continued the work to this day.